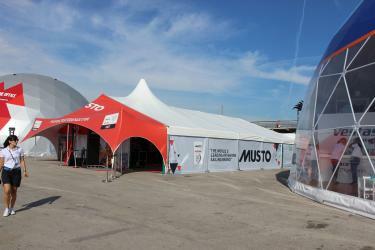 Seen on the left: the Custom Covers 12m marquee (with a CQ Cone and Solent Canopy with printed walls) assembled in the Alicante race village at the first stage of a round the world Volvo Ocean Race for Internatiomnal clothing brand Musto. The Volvo ocean racers are currently on the 5th stage of the race sailing through the Southern Ocean and headed for Itajai, Brazil. Our versatile and visually stunning marquee is unpacked at each stage of the race to become a bespoke retail outlet (see above) in the race village and then packed back into a single container (see image below) to reach the next stage before the racers. It's fair to say this is a test of our structures' strength and endurance. Petra Carran from Musto told us while setting up in rain and strong winds our marquee was "rock solid and didn't leak at all" while "all the other stalls experienced problems." Leading the way as it stands!.